Several hillclimb enthusiasts have asked me recently "what's up with BUMPS?" The website at hillclimbseries.com was down. I had hoped it was just a case that somebody forgot to renew the domain name registration. So I pinged a couple BUMPS hillclimb race directors to see what was going on. I was disappointed to learn BUMPS has disbanded. To be sure, the individual races will still go on, but no longer as part of an organized championship series. It was a good run for seven years. Many KOMs and QOMs were crowned. Registration numbers have dropped off a bit at some of the hillclimb events. I believe there are many factors behind this. Interest in road cycling peaked a decade ago. We know today that doping fueled much of the excitement and perceived growth in the sport. The house of cards came crashing down, leaving disillusioned cycling fans in the ruins. Even the USA Pro Challenge in Colorado is going on a hiatus this year. Has interest shifted in another direction? Absolutely! Cycling in the US is alive and well. Recreational and competitive cyclists alike now sell out events where fun is emphasized over competition. On the road, gran fondos have become more popular than traditional road races. These events may be timed or have timed segments along the course, like a few prominent climbs for example. Thus it quenches the thirst for competition, but most of the event can be completed at a more recreational pace. Similarly on the MTB scene. Many racers have switched over to the enduro format of racing, where there are timed segments along a course or different timed stages over a period of a few days. The timed segments are usually point to point and downhill, but not always. There is more emphasis on skill and less on racing head to head with your peers around laps of a circuit. Then there's the 'tweener category of gravel grinders. These events sell out quickly with many hundreds of participants. They are billed as a fun ride, but those at the front are no doubt racing to cross the finish first for bragging rights. Grinders are mixed surface, everything from paved roads to rough singletrack, and usually ridden on a 'cross bike. Check out the VT Epic weekend. A new 70 mile VTMonster course has been added with 9000ft of climbing! This is the new face of cycling. The traditional camps of road racing and MTB racing have been blurred by these new formats. It is evolution of sport. Change is inevitable, healthy and expected. Hillclimb racing has always been a bit of a fringe, esoteric camp of the cycling tribe. I still have a great fondness for climbing and will still compete in local hillclimb events. Just as interests in the cycling community have evolved, so too have my personal interests. I've developed an unexpected passion for climbing on foot. I've hiked most of New Hampshire's 4000ft peeks in the last nine months. The pace and rhythm of hiking is very different from riding or skiing, but equally effective for putting one in a flow state. I'll put a note up on northeastcycling.com when I get a chance. Most of the local hillclimb races will go on as usual. Equinox is back this year! Washington is nearly sold out. Then there is Whiteface, Okemo, Greylock, Kearsarge and Wachusett. The July Newton's Revenge race on Mt Washington is taking a year off. Hard to say if Ascutney will come back this year. That still leaves seven northeast events to test yourself in. One other event I'd like to mention is the inaugural national hillclimb championships on Pikes Peak in August. A couple of people have ask me if I was interested. I plan to visit Colorado a few weeks later, so I can't make it. I've raced Pikes Peak twice when it started down in Manitou Springs. The scenery is spectacular, the climb brutal. The race now starts just above 9000ft, but it is comparable to a Mt Washington in vertical, almost as steep, with rarefied air! Think you've got the goods? Head to Colorado in August for your chance to zip on a stars and stripes. Can we stop with the fat? Summer 2016 will mark the 20th year that I identify myself as a cyclist. Back in 1996, Fat Doug threw a leg over a bicycle to save his body from eventual diabetes and heart disease. Hard to believe how fast those 20 years went by. Best 20 years of my life. This post isn't about Fat Doug or that kind of fat. Over the years I've ridden many types of mountain bikes configured in all manner of ways. For years I was a hardtail holdout, riding narrow 1.95" tires. Back then I thought 2.2" wide tires were really fat, rolled too slow and were too heavy. Perhaps one of the biggest abominations I rode was my Titus Racer-X full suspension bike with 1" wide road tires up Pikes Peak. Yeah, that drew some weird looks. 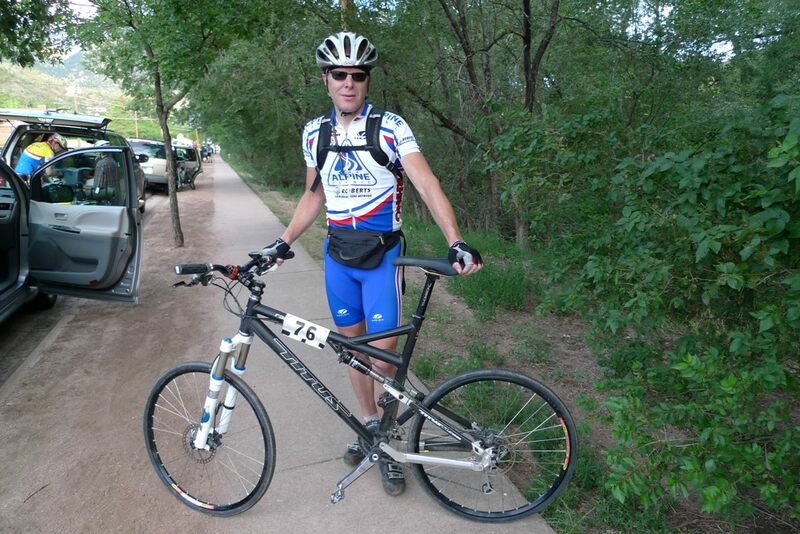 I could only bring one bike to CO, and I wanted to ride up Pikes Peak again on a closed course from 6000 to 14,000ft. After the race, regular knobbies went back on the bike. Funny back then, mountain bikes were called fat tire bikes, presumably to differentiate them from road bikes. An abomination! Not just the bike, the fanny pack too! As the MTB community weened itself from fretting over grams, bikes got beefier, travel longer and tires wider. We were still just riding our bikes. There was no need to say "I'm riding my 2.2" bike today," or "I'm riding my 2.4" bike today." All that mattered is you rode. But then came along winter fat bikes, which are just called "fat bikes" today. The old fat bikes, regular mountain bikes, are ironically call skinny bikes now. The fat bike Kool Aid was quite intoxicating. Everybody had to have one, even roadies that had never mountain biked in their life. Suddenly, things changed. You could ride only fat bikes on groomed snow. Fat bike races appeared on the calendar, where, you guessed it, only fat bikes were allowed. Group rides were advertised as fat. Ride reports, Strava posts, Facebook statuses all had to say if a ride was fat or not. Now that the snow is gone, the distinction persists. Why is this? I can think of several reasons. Perhaps the infatuation with riding fat bikes got so deeply embedded in our psyche that we have to shout out "fattie ride!" every time we ride our fat bikes. The bikes do certainly offer a different ride quality, and I can see how some folks like it. Maybe it's something else. Fat bikes run with low PSI in the tires certainly don't roll as fast as our nimble, capable full-suspension 29ers. Could touting a ride as "fat" be some sort of "I'm not slow, I was just on my fat bike!" apology? Sometimes only a fat bike will work in the conditions. Perhaps calling a ride a fat ride is explanatory for how you were able to accomplish the ride given the conditions. Certainly after a big snow dump, anything but a fat bike would be a miserable experience. This distinction of fat vs. non-fat riding becomes apparent only via the social media. What if social media didn't exist? What if there was no way to exclaim to the world "we're on our fat bikes!"? If only the people you're riding with know what bike you are on, there'd be no reason to say "I'm riding fat today!" It would be obvious to them and they wouldn't care. You would just be out riding your bikes, like in the old days.